So I am going to be very real right now. I have struggled with acne my entire life, from puberty all the way into adulthood I have had constant break out and always had to hide behind makeup or rather just never show my face. I tried everything, but it wasn’t until after I added Aidans Skin Creme to my daily routine did my face really start to clear. I know, I know, how clique and fake does that sound? But seriously though, I don’t ever write about anything unless I have tried it for myself. 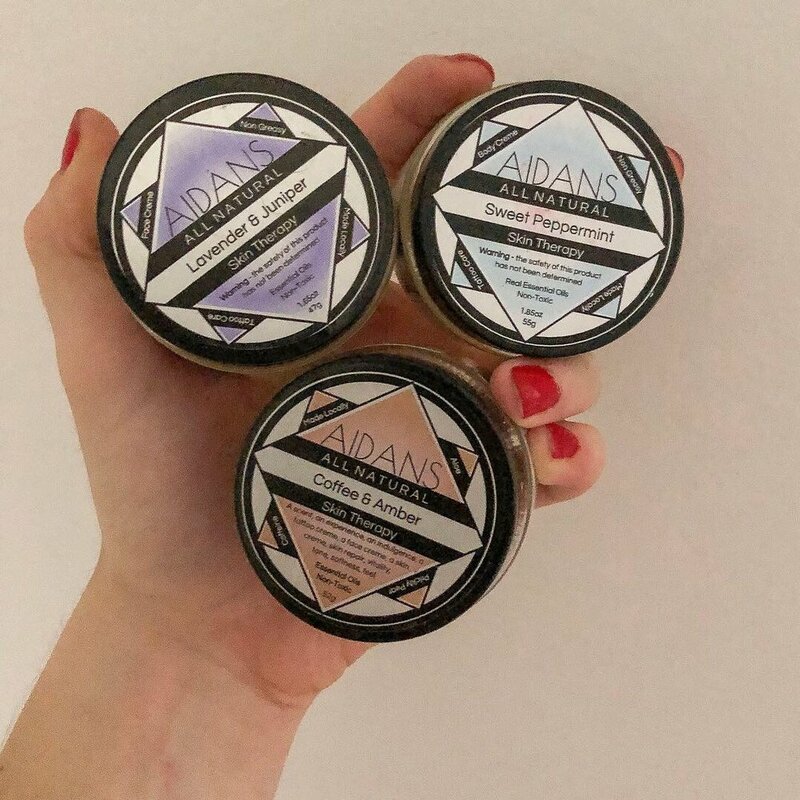 I was sent some samples from Adains a small shop in Boulder, Colorado (shout out to my home state), Coffee & Amber, Lavender & Juniper, and Sweet Peppermint. Personally, the Coffee & Amber is my favorite. It smells amazing and something Adians guarantees is a non greasy feeling after application and they are right. It always leaves my skin soft and it also reduces the redness in my face. Having Russian, Irish, and English blood pumping through my veins I don’t tan very easy. There passion is to showcase the astonishingly unique range of topical creations that appear in rare, minutely balanced blends of natural ingredients. All color, consistency, and smell is achieved solely using refined natural ingredients. No artificial chemicals. I am a huge advocate in natural remedies. These cremes are essential oils that can be used for tattoo aftercare, daily care, aromatherapy, breakouts, inflammation, dryness. I totally 10/10 recommended for those who have suffered with acne problems like I do and for those who don’t want to break the bank to fix their problems. Plus it’s Atlas approved so you all know how worth while it is!